Trend Micro Internet Security Pro safeguards your online transactions, identity, and irreplaceable files with the most comprehensive protection available. Get all the benefits of our proven internet security plus enhanced identity theft protection, Wi-Fi validation, data theft protection, and system recovery. Trend Micro internet Security makes it easy to protect your home network, personal identity, and online activity. It guards against present viruses, spyware, and identity theft as well as the web threats of tomorrow. Confidently e-mail, shop, bank, or share photos online, knowing your privacy and files are well protected. Trend Micro™ PC-cillin™ Internet Security is the first personal Internet security solution specifically designed to extend desktop security to your home and wireless networks. Trend Micro PC-cillin Internet Security combines award-winning antivirus security and a personal firewall for comprehensive protection against viruses, worms, Trojans, and hackers.It also detects and removes spyware and blocks spam. It even guards against identity theft by blocking phishing and pharming attacks. Plus, PC-cillin protects your wireless network with Wi-Fi Intrusion Detection, an innovative security feature that alerts you when an intruder uses your Wi-Fi connection. 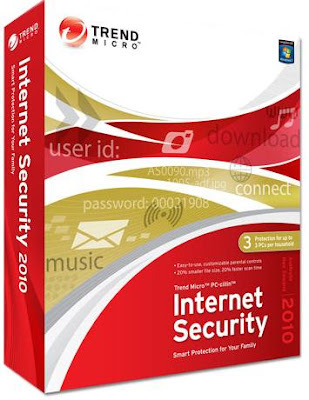 Easy to install, configure, and manage, Trend Micro Internet Security 2010 automatically updates and immunizes your PC and removes malicious threats buried deep inside your computer. With features for home network protection, URL filtering, data theft and online fraud protection, unauthorized change prevention, and much more, this superior suite goes far beyond the basics.